As it rains, ZincShield® releases zinc-ions that keep ugly roof stains, algae, moss, lichen, mildew and fungus off your roof. Stains can damage and shorten the roof life. ZincShield® is a 99.2% pure zinc strip. ZincShield® is installed at the top of the roof (below the roof ridge vent, roof cap or below the first row of shingles) and below any obstruction such as chimneys, skylights, dormers, etc. that block the natural flow of rain water down the roof. ZincShield® will quickly weather so that the finish will have a dull, pewter-gray appearance. Strips available in 3 Widths: 2.5", 3.5", and 6"
Will Never Rust! Protect Your Roof for 20+ Years. ZincShield® is solid zinc throughout. 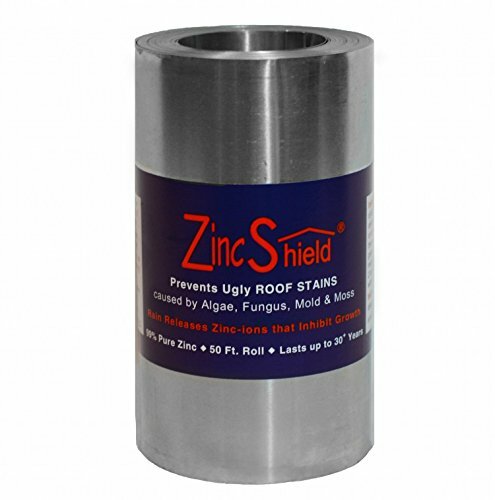 Some roof protection products being sold are made of galvanized steel and only have a thin coating of zinc. As this coating of zinc dissipates, the steel will rust. Not only is the zinc protection lost, but the resulting rust oxide can stain the roof red now! Great State Products is committed to providing you with high quality products, Made in the USA, to better your home-owning experience. If you have any questions about our products or your home, please contact us. If you have any questions about this product by ZINC SHIELD, contact us by completing and submitting the form below. If you are looking for a specif part number, please include it with your message.